Greetings from Queenstown, New Zealand, the Xtreme Sports Capitol of the World! I’ve been on trains, buses, and ferries coming from the top of the North Island, on down to Wellington for a couple of swell screenings with the artsy-intellectual crew at New Zealand Film Archives. After meeting with a woman who collects found-footage 16mm films from rural NZ communities, and taking in a heap of local music, art, and radio upon the guidance of my Wellington film hosts, I headed down to the South Island, the area with the highest percentage of “Lord of the Rings” locations. You can get plenty of “LOTR” tours, complete with costumes you wear and swords you fight with, but not being a big fantasy film guy, I had to do something Mt. Dew commercial-style-crazy (raft-it, heli-bike-it, bungy-jump-it, jet-boat-it, free-board-it, mountain-bike-it, sky-dive-it, snowboard-it, hike-it, paraglyde-it, do-whatever-you-can-think-of-to-be-xtreme! ), so I chose jumping off a cliff, free-falling 200 feet in the air and then swaying across the Shotover Canyon on the world’s highest swing, probably the coolest, most life-affirming 3 minutes I spent in Oceania. The guys who work there were ‘xtremely’ cool as well, taping my digital camera to my hand (after learning I was a filmmaker) so I could get up-close-and-personal footage of the experience. Check it out here on my blog: http://www.ruralroutenomad.tumblr.com (where you can also read about a solo camping experience that turned pretty xtreme as well). Life is good here in New Zealand, especially for the many sheep and cows and deer that graze on some of the greenest grass up-&-down both islands that I’ve ever seen. There might be more livestock than people overall, but the local Kiwis I met were most all progressive, green (nuclear-free), ingenuitive folks. And there are plenty of travellers who wind-up staying here and working/hiking/living for months, or permanently – just last night, I met a bartender from England who’s been living in Queenstown for 3 years making some pretty incredible Xtreme sports videos with his friends (some of which we hope to show in the RRFF!). Prior to this, I’d been snorkel-road-tripping around Australia, while setting up future RR screenings. I also met a filmmaker from Canberra who makes puppet movies and has done documentary work with modern Aboriginie cultures in the Outback. And, prior to all this, of course, were the amazing Antarctic and South American continents. Next up is a whole new continent – Asia – and what are sure to be some very special screenings in the rural villages of the Jian Province. Please feel free to drop a line, and if you or someone you know is in South Korea, China, India, or Nepal over the next few months, look me up! 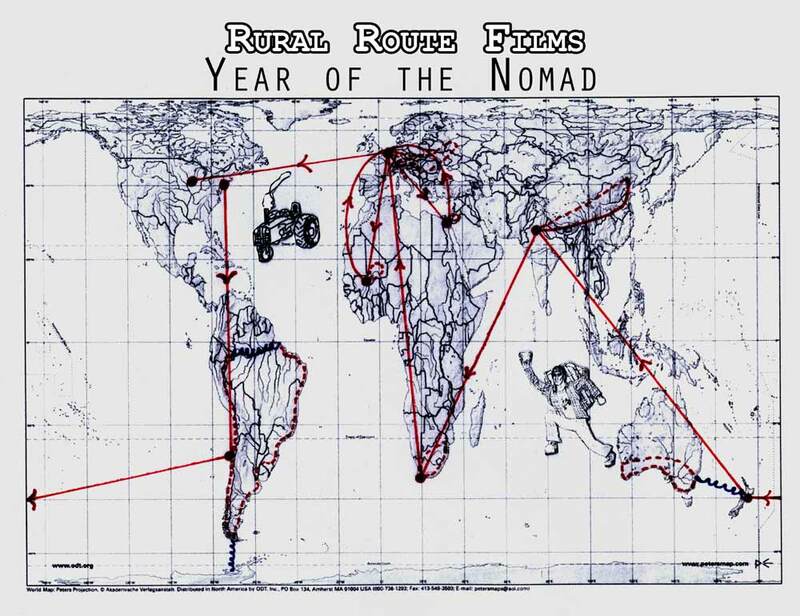 And, if you don’t have one already, order yourself a “Best Of Rural Route” tour DVD from http://www.ruralroutefilms.com/home.htm, and have your own copy of the selections that audiences around the world are enjoying (I’d say “Bear Hunter”, “Sobre la Tierra”, and “High Plains Winter” were the favorites in NZ!). I know times are tough, but it’s a good bargain for the buck, and comes with some pretty cool original artwork as well.